A sumptuously soft padded cot bed bumper featuring charming Forever Friends appliques and embroideries. 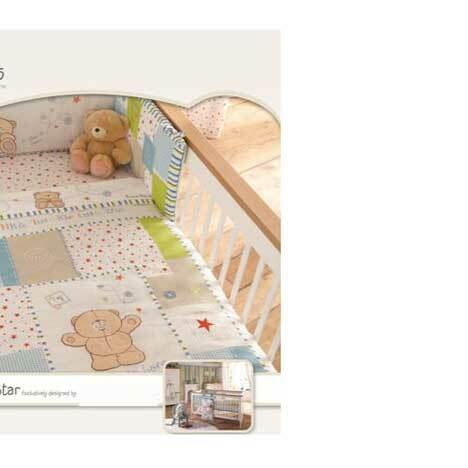 Charmingly boyish, Forever Friends Little Star appeals to little boys who sparkle. A fresh white backdrop is teamed with a zesty palette featuring striking shades of lime green, aquamarine and tangerine. Colourful text embroideries and striped trims combine with blue check and orange star prints for a truly boyhood feel. The snugly and soft Forever Friends bear appliqués make this a truly indulgent design for the nursery, a room for sharing the warmest of hugs with your little one. 100% cotton (100% polyester filling). Part of a co-ordinating collection.